I have been searching high and low for the perfect vintage style t-shirt to pair with my destroyed denim. I love this look because it is perfect for a casual day around the city but also has a cool rock and roll vibe. 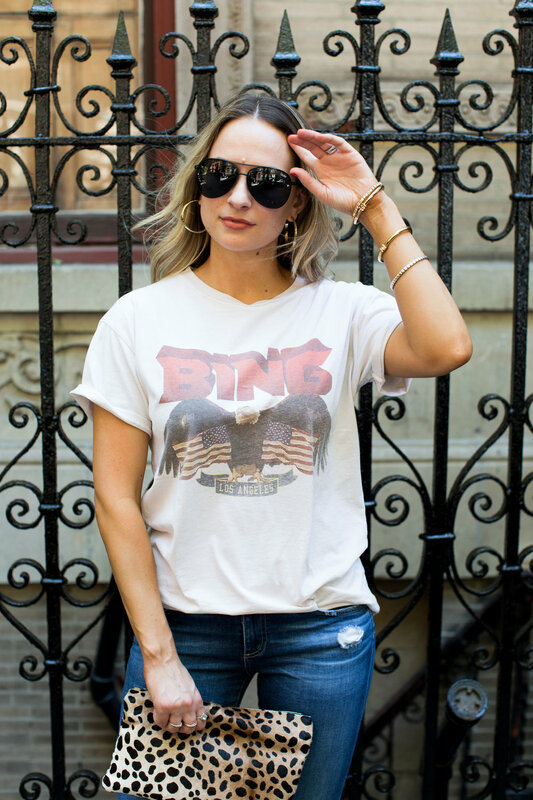 I was so excited when I found this Anine Bing vintage tee because it was just what I was searching for! I love the graphic paired with the bing logo and even though this is not technically a vintage shirt, it definitely has that vibe. The fit of this tee is very boxy and oversized (this is a size small), so to tailor it I rolled the sleeves and half tucked it into the jeans. To add some more edge I paired it with my leopard Clare V. Clutch and Stuart Weitzman heels. Anyone who knows me, knows that this jeans and t-shirt look is what you can find me in 95% of the time! To shop, click the links above and below!